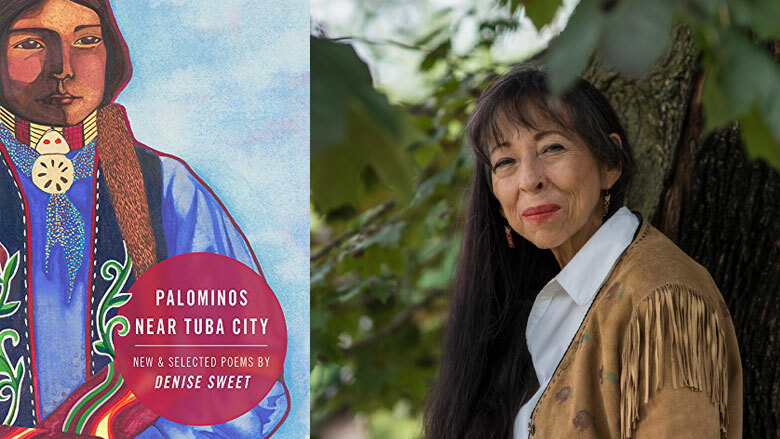 Readers familiar with Anishinaabe poet Denise Sweet’s work must be well aware of how engaged and perceptive she is as an interpreter of what’s going on in the world, how things happen, and why they matter. A professor emerita of Humanistic Studies, Creative Writing, and First Nations Studies at the University of Wisconsin–Green Bay, Sweet served as Wisconsin Poet Laureate from 2005 to 2008. She is a widely anthologized poet and author of three collections, including the award-winning Songs for Discharging (1997). Given the centuries-long history of colonialism that brought countless indigenous peoples to their knees, that patron saint of Christianized beggars—in one of the hemisphere’s most impoverished nations, no less—appears in a far-from-divine light. To Sweet’s credit, this is suggested through language and sharp observation, rather than delivered as a polemic. The same holds true throughout her other poems in the collection, which convey her deeply moral center without being overly moralistic. I bear an unearned pride that makes no sense here. America could use more poets, travelers, and citizens like this. Sweet’s awareness of privilege, place, and the way people around her see her, expressed with plainspoken gravitas, elevates the experience of travel to that of poetic journey. Privilege of another shade, and in another place, gets called out in a number of poems about America in this collection. In “Indian War,” Sweet takes on the pervasive stereotypes of Native Americans in professional sports and popular culture. Part of her powerful response: “On the prairie of justice and imagination / I go back to the Lakota Nation and / the tradition of restraint and male mockery.” Exactly what form such male mockery takes in this poem is quite funny, yet dead serious. Due to my unfamiliarity with some of the references and vocabulary found in Palominos Near Tuba City, I occasionally felt like a visitor when reading this collection. Terms from the Anishinaabemowin, Mayan, and Spanish languages stand out on the page—chimookamon, kachikel, cofradias—and leave me thinking how richly they must resonate when Sweet reads them aloud. Because she provides a glossary for the Anishinaabemowin words, Sweet comes across as a welcoming host who wants to share her language and culture with her readers. By not including the words from Mayan and Spanish, Sweet perhaps suggests that readers who don’t speak the languages should do some work on their own, which again riffs on themes of travel and awareness. Like a travelogue to which one returns, always to learn something new about both people and place, Palominos Near Tuba City is worth reading and thinking about again and again. Mark Zimmerman represents the Wisconsin Fellowship of Poets on the Commission. Since 2004, Mark has lived in Milwaukee where he teaches humanities and writing courses at the Milwaukee School of Engineering, and where he has won the Johnson Controls Teaching Award (2012-2013).